Unlike all other clubs in your bag commonly referred to as “swing” clubs, the putter may be the most important. Custom fitting is not just for your driver, fairway woods, and irons. The putter is generally the only club you use on every hole and your main scoring tool. Many people believe that selecting a putter merely involves personal preference. That is partly true. You need to be content with the look and feel of the putter. However, it also needs to fit you perfectly in terms of “playability”. A custom built putter or even a custom fit putter can take 4-8 strokes off your game. Those 3 putts become 2 putts. Likewise, 2 putts become a 1 putt. Putter Fitting takes 6 key points into consideration that can all be adjusted using our various equipment. The proper length will help you achieve your optimal setup for a more fluid and repeatable stroke. Length is critical to achieve proper “eyes over the ball” position stance and quite essential to improving accuracy as well as distance control. Matching the top to bottom balance to your personal stroke will provide a smoother, more reliable path from takeaway through impact. Ideal balance is achieved through a trade-off between club head and grip weight. The proper lie angle will give you a better chance of keeping the ball on line. The most important aspect of the lie angle is that it promotes good posture and eye position over the ball. 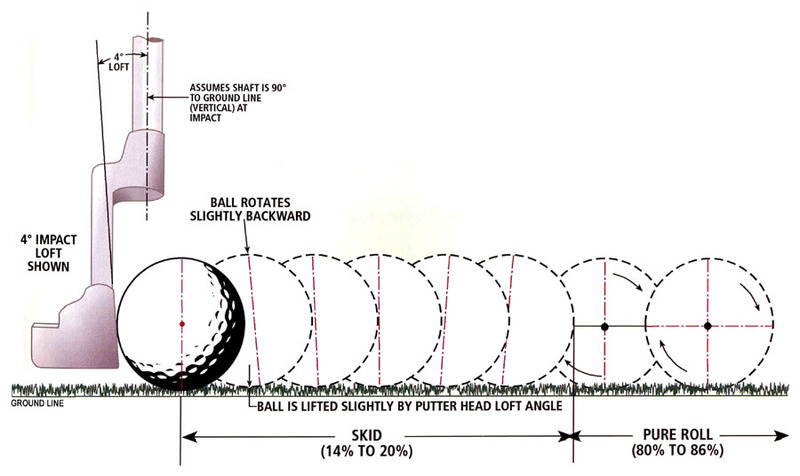 The proper loft will allow the ball to achieve true roll more quickly, minimizing bouncing and skidding for enhanced accuracy and distance control. You usually need some loft to lift your ball out of the slight depression caused by the ball’s weight, but many putters have too much which facilitates a further skid factor. The appropriate head weight for your physical attributes and pendulum stroke will steady your hands and assist you to strike the correct balance between touch and distance control. The right types, style, and size grip for your hands will enable you to have a consistent stroke. The proper grip fit will offer you a steadier hold on the putter as well as promote a desired shoulder-and-arm pendulum stroke. The putter fitting tool we use is a great asset to getting you fit for the right loft and lie angles. We also have a putter roll board and practice mat. These are great items to gauge your putter needs. At Better Golf Shot, we mechanically assess the type of putter, which suits you best. Of course, style of putter is what a lot of people also do not take into consideration. We have both blade and mallet putters in several sizes for you to try. Most of the various heads we offer will be in stock to see and feel. Finding a putter that can visually confirm and conform to your target line will ensure consistent accuracy. It is all about alignment when we recommend a putter style. Good putting alignment comes from the ability to align your putter’s face directly to your target. Many players have trouble with alignment. The golfer either starts a putt off line, or has to make an angle correction to get the ball on line. Neither option is good in order to achieve consistent putting performance. Another part of our putter fitting program uses our skid board to true roll. We can use it to determine the skid factor of your current putter and advise you about what we can do to change it for the better. Dynamic loft, in other words, is loft at the point of impact. It only makes sense that a putter with lower loft will cause the ball to jump up in the air less than a putter with higher loft. The sooner a ball contacts the ground, the sooner the ground starts to put friction on it and cause it to rotate. The only thing that causes a golf ball to roll forward is its friction in contact with the ground. A typical off-the-shelf putter will have between 3 and 5 degrees of loft. Many grooved putters will have less than 2 degrees of static loft. So, for a player using the exact same stroke, the dynamic loft (loft at impact) will be lower, regardless of that player’s stroke. You can conclude that if a player with a typical putter (4 degrees loft) is reduced to a 1 degree loft, the golfer would see similar playing characteristics to most grooved putters. In other words, it’s not the grooves that promote good roll; it is just that the dynamic loft is lower. This fact promotes the idea of adjusting your putter loft as opposed to going out and purchasing an expensive putter with special face grooving or deep etching. Although these items do not help roll, position of the “center of gravity” (COG) within the putter head does indeed affect ball roll. Direct placement of the COG on the impact point can greatly increase the efficiency of contact and lead to a lower flight off the face. In smple terms, the misalignment of the COG and the impact point can cause the ball to fly up in the air, while an aligned COG and impact point would eliminate this reaction. However, almost all putters do not position the COG high on the face, and, thus, it is nearly impossible to find a model that does this. Again, the alternative is to adjust the putter loft. We can also use our equipment to check the COG point of your putter and find out exactly where it is at.